Dr. Mariza Snyder is the author of six previous books, including the bestselling The DASH Diet Cookbook and The Smart Mom’s Guide to Essential Oils. For the past nine years, she has lectured at wellness centers, hospitals, conferences, and corporations on hormone health and essential oils, nutrition, and detoxification. Dr. Snyder is the host of the Essentially You Podcast and has been featured on Fox News, MindBodyGreen, Dr. Oz, the HuffingtonPost, and in Women’s Health, Shape, and Self magazines. 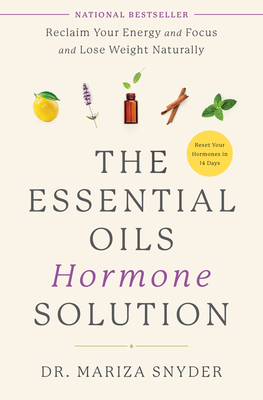 "Dr. Mariza uncovers the power of essential oils for women’s hormone health and lays out an easy-to-implement plan with groundbreaking essential oil remedies for fast-acting results. Every woman needs to read this book." “Dr. Mariza is smart, honest, and committed to creating powerful, natural solutions for women who don’t want to take synthetic hormones. She pairs the power of plant-based therapy with effective lifestyle habits to move the needle in women’s hormone health." --Dave Asprey, New York Times Best Selling Author of The Bulletproof Diet and Head Strong. --Amy Myers, MD, New York Times bestselling author of The Autoimmune Solution and The Thyroid Connection.